Strong, durable, and sturdy, the BULLDOG 12,000 lbs. support capacity square jack is the BIG reason why BULLDOG has carried the load in trailer industries since 1923. 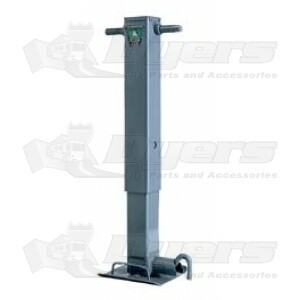 All BULLDOG 4" square jacks are rated for 12,000 lbs. support capacity and 10,000 lbs. lift capacity. The strength of the product, plus the wide variety of styles, makes this jack the best choice in its product class. 4" square tubing, 7-gauge superior alloy steel. Painted outer tube, inner tube, and drop leg. Drop leg option with 5 positioning holes. Easy-access gear box with grease fitting for routine maintenance. Spring return drop leg or non-spring return drop leg. 12.5" screw travel, 13.5" of additional adjustment with drop leg. Front facing drop leg plunger pin or side facing drop leg plunger pin.